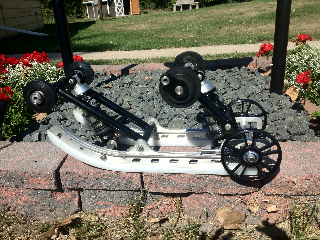 A Laager Racing chassis with a Laager Racing engine won the 2019 F1 World Championship in Eagle River. This stator plate is made from solid aluminum billet with a bearing to stabilize your crankshaft end. You mount your existing coil onto the billet plate using the screws from your old plate. This stator will help save your crankshaft magneto end from braking. A broken magneto end will cost you downtime, an expensive crank rebuild, and most often broken magnets in your flywheel. Replacement flywheels are hard to find and expensive. This stator plate is for Suzuki engines with electronic ignition. Call for details and pricing. 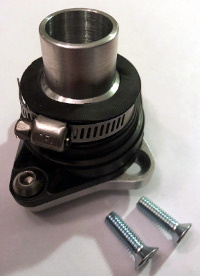 This carb mount stops a lot of the vibration because of the rubber boot. The kit comes complete with metric mounting screws, stainless steel button head bolts, rubber boot, CBC machined mounting plate, hose clamp, and aluminum billet carb mounting tube. It is a must for racers using an 18mm Mikuni carburetor. Price: $85.00 per pair. Contact us to order. 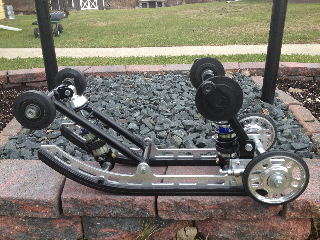 We have a new chassis for this race season. The prototype was raced during the 2016-2017 race season. The 2014 modified 120cc Sno Cross World Champion won with a Laager Racing skid frame. The 2014 stock Kitty Cat World Champion ran a Laager Racing motor. The 2014 Formula 1 Kitty Cat World Champion rode to victory on a Laager Racing chassis and motor. 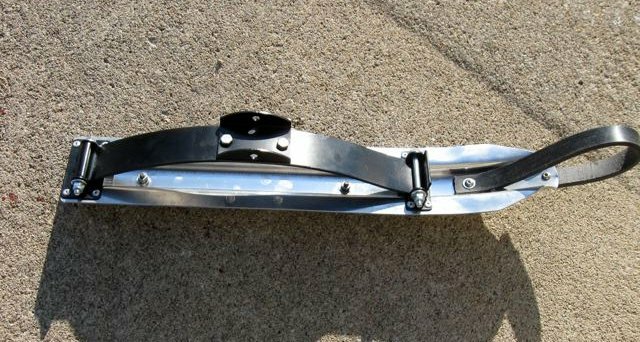 This 120cc snowcross skid frame was custom built, using customer-supplied rails and rear wheels, to fit a Polaris with an Arctic Cat track. Call or email with your custom requests. This skid frame, built for a Polaris 120, has custom Fox shocks, chrome moly arms, CNC-machined rails, and billet rear wheels. Call or email with your custom requests. Lightweight Aluminum Skis for your Kitty Cat. This aluminum ski is cheaper than a stock ski, which is made of heavy (think: slow) steel! Price: $249.00 per pair (wear runners and ski hoops included). Contact us to order. This kit is the answer to your carburation woes. It fits both Kawasaki and Suzuki stock Kitty Cat motors and includes all parts for a simple installation. We even install the throttle cable. Simple installation instructions are included. No fuel pump is needed if you raise your gas tank (place a piece of wood under your tank). These carbs were designed for gravity feed. The complete kit is only $159.00. Contact us to order. We have been building modified Kitty Cats since 1989. Many of the worlds fastest Kitty Cats use our products. 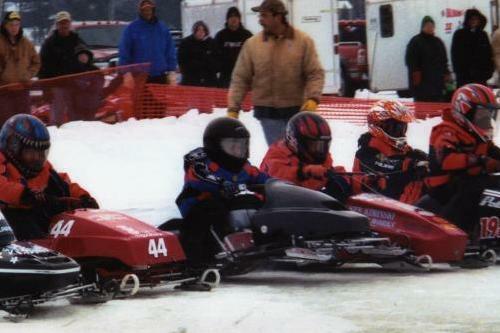 Snowmobiles built in our shop have won "World Championships" at Eagle River, Wisconsin and the "World Series" at Chisholm, Minnesota. Below is a Laager Racing snowmobile getting a great, ski-lifting holeshot. Laager Racing is dedicated to improving the performance of our products. A dyno test should provide all the proof you need: Our current engine has 30% more horsepower than the previous model.